Saber® grill’s exclusive and patented Infrared cooking system generates infrared heat. Radiant heat, unlike convection heat used by traditional gas grills, directly cooks your food. Convection cooking relies on hot, dry air and radically reduces food’s natural moisture content. Our patented Infrared cooking system directs airflow away from the cooking surface, locking the food’s natural moisture, producing moister, more juicy results. 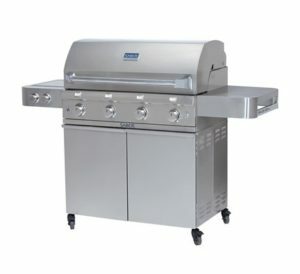 The unique, patented design of Saber grill’s cooking grate and IR emitter prevents flare-ups that char meat and create dramatic temperature fluctuations. Instead, our exclusive system vaporizes any drippings and adds natural smoke flavor to grilled foods. Since liquids and debris are prevented from reaching the burner system, maintenance and clean-up are much easier. 304 commercial grade corrosion resistant stainless steel is used in the construction of Saber burners, IR emitters, and cooking grates, guaranteeing years of worry-free and maintenance-free cooking enjoyment. BTUs have nothing to do with cooking performance, but everything to do with how often you refill your propane tank or the size of your gas bill. Saber grill’s Infrared cooking system is designed with fuel efficiency in mind. Our patented IR cooking system uses Infrared’s longer energy wave to more effectively and efficiently cook food, locking in moisture and reducing cooking times. You can now cook faster with fewer BTUs, reducing your gas consumption by 30%. That makes it good for both your wallet and the environment. Available in silver or black, Saber cast iron grills feature cooking zones that allow you to adjust the cooking surface according to what you are cooking and the number of people for whom you are cooking. Cook a hearty steak right alongside a tender piece of fish. Saber gives you maximum performance and value for your investment!